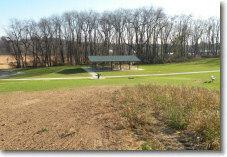 With land purchased in 2006, Veterans Community Park will be completed in phases. Phase I construction included a parking lot that accommodates a sled-riding hill, park shelter and dog park. This phase also included an ADA playground which allows children and adults to access the playground with any type of mobility device, a service Plain Township is able to provide thanks to a grant from the Ohio Department of Natural Resources. The dog park is on the east side of the park, along a group of trees that provides shade to park goers and their dogs. This free-access dog park is open year-round and has a 1.5-acre section for small dogs (under 30 lbs) and a 2.5-acre area for larger dogs (over 30 lbs). Lush green grass gives your pet the perfect playground to exercise, play with other dogs or just rest in the shade. These areas are maintained by Township Maintenance staff on a daily basis and disposal bags are provided to encourage dog owners to clean up after their pet. Plain Township will be continuing the It's My Doodie Pledge program, which will give dog owners an opportunity to have their pet's picture displayed on the Township website in the It's My Doodie Gallery. In addition, Plain Township has included a solution for overheated or muddy dogs. As you exit the dog park, you have the option to clean Rex by using one of the six dog showers available in the spring, summer and fall. Please honor the Dog Park Rules to ensure a happy visit.